Eliminates messy clean ups and costly waste. PERMATEX has released Gel Twist, a threadlocker gel that eliminates messy liquid drops and solid stick globs. It is just as reliable and much easier to use than conventional liquid and solid stick threadlocking methods. It eliminates messy clean ups and costly waste and it can be applied in hard to reach spots, including vertical applications. It is available in either high strength red or medium strengths and locks and seals while preventing parts from loosening. It protects threads from corrosion and cures in 15 minutes. 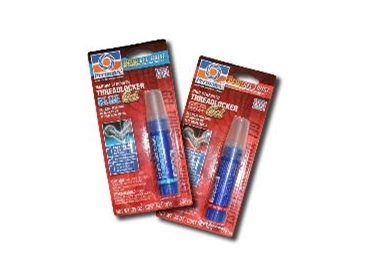 Medium Strength Threadlocker Blue gel reliably secures all nut and bolt applications and locks threaded assemblies while allowing for disassembly with normal hand tools. High Strength Threadlocker Red gel is for heavier-duty jobs and is suitable for reliably securing all permanent nut and bolt applications. It eliminates the need for a costly inventory of mechanical locking methods such as split ring lock washers, toothed lock washers, serrated flange nuts and ribbed flange bolts. Red gel may require heat or special tools for removal.